Analysis: breaking something into its parts and pieces so that we can closely examine it and, ultimately, come to a better understanding of the whole. Literary analysis: when we do this with a piece of literature. In the traditional high school English classroom, literary analysis has looked one way — like an essay, sometimes in five paragraphs, beginning with a generic introduction, thesis statement, body paragraphs (following a strict topic-sentence-followed-by-evidence-and-explanation format), and a conclusion that regurgitates all the was said before. But look at the definition of analysis again. Can we teach students to use these same skills — thoughtfully, deeply — and come out with a different product? Last week, we looked at one way to approach this in a writing workshop classroom — breaking literary analysis into sub-genres, teaching the techniques and characteristics of that sub-genre, and using real world analysis examples as mentor texts. You saw two different technique-based analysis workshops as they lived in my classroom: an analysis of two texts side-by-side and a character analysis study. But there is another way to approach literary analysis in the writing workshop: literature-based analysis studies. After we have studied a work of literature together, that text morphs into a writing mentor text, and students craft their own piece based on the work of this mentor. Literature-based analysis studies came to life in my classroom because I wanted to give my IB students a different kind of writing experience, while still focusing on the whole-class literature we are required to study and analytical skills they will need for their exam and for their future. This is the ultimate double-duty workshop classroom moment. Students already do the noticing and studying of craft moves as they read and discuss the text. They simply lift the analysis they have done in their reading and translate it into a piece of writing! For this reason, literature-based analysis studies tend to be a bit shorter than technique-based analysis studies. 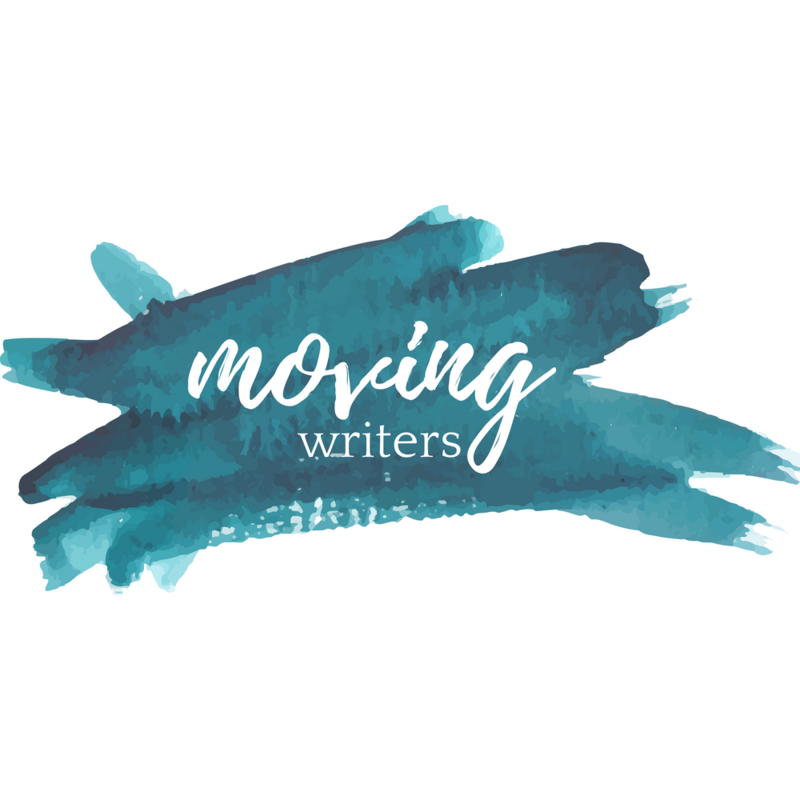 Students choose some of the mentor’s moves to put into their own original piece of writing, in the same style as the mentor — when we study a poet, the students write poetry; when we study memoir or essay, the students write memoir or essay, etc. Students write a brief commentary analyzing how their own mentor-inspired choices have impacted the overall meaning of their piece. Analysis is all over this kind of work — analysis of a text, analysis of a writer’s choices, analysis of one’s own writing and the impact of one’s own choices as a writer. My students report that this is way harder than they thought it would be. Here’s a taste of a literature-based analysis study my students did after studying the poetry of Seamus Heaney. After we concluded our reading and discussion of a collection of Heaney’s poems, students were charged with studying Heaney as a writing mentor and crafting an original poem that bears his marks. 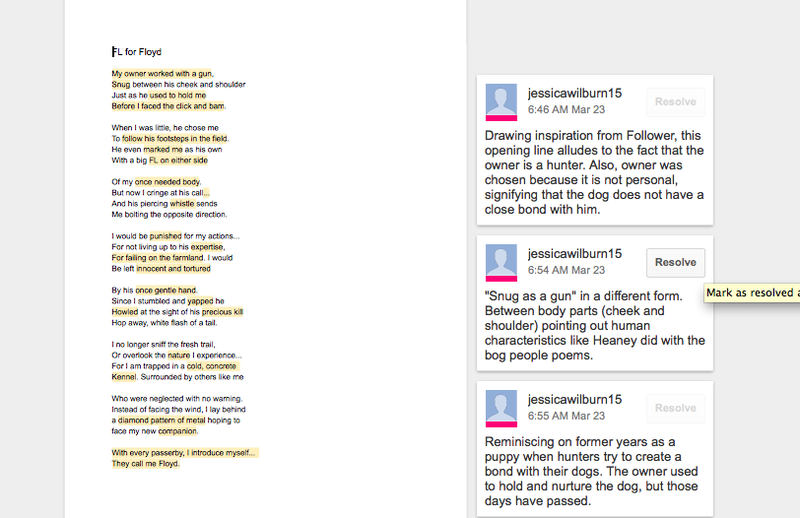 Students submitted their work in Google docs, and added comments throughout their poems to show Heaney’s influence. They concluded by writing a brief commentary detailing how their choice of Heaney-inspired techniques impacted their final poem. You can find my complete assignment sheet with rubric here. In a literature-based analysis study, students study the text as both readers AND writers. So, I did not teach any additional lessons specifically for this writing study. Students had always considered craft as they considered Heaney’s purpose and meaning — the writing study was simply a matter of weighing them against their own original work. Before I faced the click and bam. To follow his footsteps in the field. Of my once needed body. Me bolting the opposite direction. By his once gentle hand. Hop away, white flash of a tail. Who were neglected with no warning. I was inspired to write this poem about Floyd, who is a real dog that I got to see at the Richmond Animal League when I volunteered there on Saturday. I was really drawn to him because of his markings, so I decided to write this as a way to give him a voice. My purpose was to express the negative effects that a poor relationship can have on a person or animal. I chose certain phrases to allude to the theme of violation or punishment, signifying that the relationship between Floyd and his previous owner was not a good one. A lot of alliteration is present with the letter “f,” showing the lasting impression that the owner’s initials had over Floyd, and how his past experiences scar him. The reader is taken through Floyd’s journey with his owner, which shifts from good in the puppy years to bad, and ends with Floyd at the shelter searching for new life. In this way, another theme is rebirth. Also, I used ellipses in order to omit information as well as leave a sense of the new experiences to come (in the last stanza). When studying Heaney I was drawn to his use of different aspects of poetry which he incorporates to emphasize one overarching theme. His use of nature is apparent in many of his poems, and I think that this represents his connection to his surroundings. I thought that both of these things were important to include in my poem as well as the different structural choices that make Heaney original, such as the strategically placed ellipses and the shortened last stanza. I was influenced by Heaney, and his experiences being Irish, in that I incorporated the idea of England asserting power over Ireland into my poem through the owner holding power over Floyd. Additionally, I take away a sense of purpose by reading Heaney’s poetry. Not only are his poems masterfully written, but also, they convey an important message. The children wonder how I look on the inside. Swatting at flies and taunting waves. They dodge invisible crabs and talk about everything and nothing. I see inside that faded blue house. Today the waves creep closer to the dunes. My insides are grey, stale and dismal. Bobbing and swaying in the wind. silhouettes against the setting sun. how I’m the only one. I decided to mimic Heaney’s poetry style and pull events from my childhood in the first person and relate them to now thus forming a lifecycle as Heaney often does. I wrote this poem using experiences and memories I have of my grandparent’s beach house on the Chesapeake bay. I decided to write it from the perspective of the lighthouse that is located in the bay near our house. I wanted to write about what this place meant to me when I was younger and what it means to me now. While I still love going there, it has changed a lot as I think all things do as you grow up, which is what I wanted to express through this poem. When I was younger we went there a lot every summer with my family and extended family. My cousins, sister and I would spend the days exploring and roaming around the beach, our neighbor’s houses and “the point”. “The point” is our name for the area at the end of the row of houses where it becomes hard to navigate due to thick vegetation, sand burrs and mud. Once you get around it there is a long strip of uninhabited beach where you can look out at the old lighthouse that stands on a little island about a mile out. When I was young this lighthouse always intrigued me and I would wonder what it looked like on the inside, and always imagined going inside it. I think my curiosity in the lighthouse was a lot like childhood in general. We have a sense of wonder in everything and imagine things we don’t know the answers to. I wanted to get that sense of childhood frivolity, wonder and curiosity across in my first few stanzas which I did with my word choices such as “wonder”, “glimpse”, “plump blackberries”,”everything and nothing” “sweet honeysuckle”, “towering”, “laugh”. My memories of my childhood there are all happy ones with my family and I tried to include nature references as Heaney does and also because many of my memories from the beach house are outside. I vividly remember my Uncle’s sailboat which was a Hobie cat, and the stories the adults would tell about going out on it. The entrance of the storm in stanza five foreshadows my Uncle’s death. He died in 2012 and my four cousins and my aunt were left without their dad and husband, my mom without her brother and my grandparents without their son. It has been hard for my whole family especially when we are all together at the beach house and he isn’t with us anymore. This is represented by the replacement of the tangible sailboat with just the memories in stanza seven. Now that I’m older I know that the lighthouse is actually disgusting and old and kind of dangerous so I have no interest in going inside it and my cousins and I are too old to play in the kitchen cabinet, which I talked about in stanzas six and seven. I used more dark and negative word choices after the tonal shift in order to mimic some of Heaney’s styles which I think helps personify what it’s like to grow up. As we grow up we realize that the world isn’t all wondrous and that bad things happen to good people. While I still love going to our beach house I don’t look at it through the eyes of a child anymore which I think has a pretty universal connection. In the last stanza I talked about how the lighthouse will probably still be there when I take my children to the beach house and they in turn have that sense of wonder and enchantment. Although my thoughts about the lighthouse have changed I wanted it to represent the thing that remains unchanged which is the importance of family and making memories that will last forever in our minds. After doing this assignment I really felt how personal poetry can be which gave me a new appreciation for Heaney’s work. After writing this poem I feel I can relate a lot better to poetry as a whole as well. I am not normally one to write about how I feel or write down memories, so having to conjure them back and really think about them had a pretty emotional impact on me. How could you envision your students enacting the skills of deep analysis while writing creatively, inspired by author-mentors? Leave a comment or find us on Twitter @rebekahodell1 and @allisonmarchett. A fantastic poem about Floyd the dog; that’s a talented student! Many congratulations on the creative approach to what’s too often a real turn-off for students.